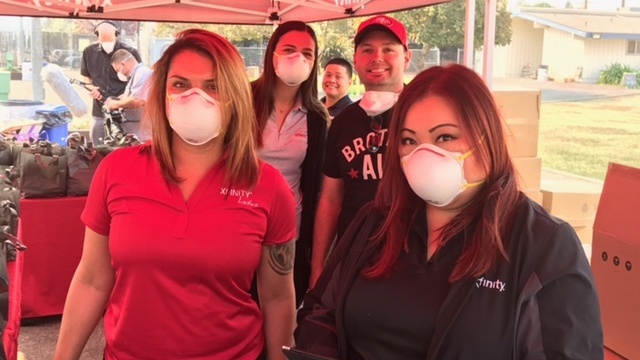 Below is a personal perspective from Jackie Chiang, a Market Development Manager from the North Bay, who volunteered with a group of Comcast co-workers to provide relief kits and connection services. Marin Fairgrounds, CA – Oct. 14, 2017 — As the team of volunteers and I arrived at the fairgrounds, I was immediately taken aback by how much activity there was. There were a sea of cars parked in the fields of grass surrounding the entry point and even across the street. As we caravanned through the entry gate, there were volunteers directing what seemed like an endless flow of cars coming in to the fairgrounds. I quickly realized that the procession of cars, all stacked with cases of water, food, blankets, diapers, and bags of I presume to clothing items, were all vehicles driving in with their generous donations for the evacuees. After being directed forward by member of the National Guard, we parked our box truck full of supplies and donations and started to get to work. As the team worked on unloading the over 1000 relief kits we had brought with us, I started to work on figuring out where we could best position ourselves so that we could be a resource to as many evacuees as possible. Walking around, my mind immediately started to take notice. A sea of donations that people had dropped off throughout the past several days, spread out across what was at least 30 long picnic tables. Around the perimeter of the area were the larger items: mattresses, pillows, diapers, toilet paper, and other bedding items. All of these items, laid out for people to take whatever it was that they needed. As I turned the corner past Herzog Hall, where evacuees could go get a hot meal or talk to FEMA and the Red Cross for assistance, I heard a woman sobbing uncontrollably. Sitting on a lawn chair outside of a tent pitched on the grass, she allowed a man to hold and console her as she so desperately cried out, “I lost everything! I have nothing left… it’s all gone.” It was in that moment, that I was able to put a face all too clearly to everything the volunteer team had been working so tirelessly for. The gathering of supplies, organizing, arranging and execution of our efforts over the last several days was no longer for the evacuees or those impacted by the wildfires. It was for that very woman and the mother, wife, sister, daughter, neighbor, or friend she represented for EVERY person impacted by the fires. As heart-wrenching as it was to see that woman in such despair, she ignited something in me that gave me an extra sense of urgency to get our teams set-up and engaged with as many people as we could. The team worked like a well-oiled machine to set-up two XFINITY tents and four tables. We lined up the relief kits on the tables from end to end and prepared to start engaging victims throughout the Marin Fairgrounds. We were on a mission. Our goal was to educate and demo for folks how they could connect to the open XFINITY WiFi hotspots for Internet access. For existing customers, it was important for us to reassure them that they did not have to worry about the damage the fire did to their equipment. We wanted it to be one less thing for them to worry about. For customers who chose to suspend their accounts, we showed them how to use the Stream App on mobile devices to provide a small escape from the current reality for their families through mobile streaming. As relief kits and information were being distributed outside, our Tech Ops team worked diligently inside to install a 65” TV and cable service for Herzog Hall, where evacuees convened for meals throughout the day.